These jagaloons from Washington D.C. love ska music, but nobody in the band can express it the way that self-proclaimed Kill Lincoln hypebeast Drew Shriver does. If you’ve ever been to any of their shows, there is a high probability that you saw Shriver jumping and dancing the entire set, making sure everyone in the crowd knows it’s okay to get weird. This music video showcases Shriver, doing what he does best: hyping. Best part about this video? I, Tyler Osborne, shot and color graded the whole damn thing (cue the thud sound effect at the end of an episode of LOST). Is this a conflict of interest? Who cares? The video is great. 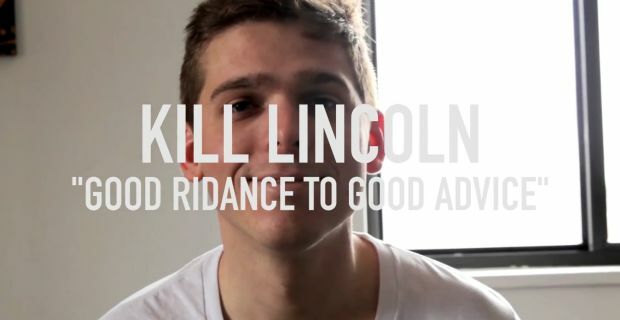 Kill Lincoln just released a new EP, Good Riddance to Good Advice, which you can pick up from Jumpstart Records here, or when you check them out on tour. It just so happens that they’re currently on the road, and because I’m that guy, I included the tour dates after the break as well. Friends helping friends. Enough talk, you probably haven’t read most of this anyway, because you only really care about the music, which is probably the right move. I get that, but if you’re still with me, thanks. It’s been a weird day. Put on your shoes, open up some space at your desk or room, and get dancing to the new Kill Lincoln video.